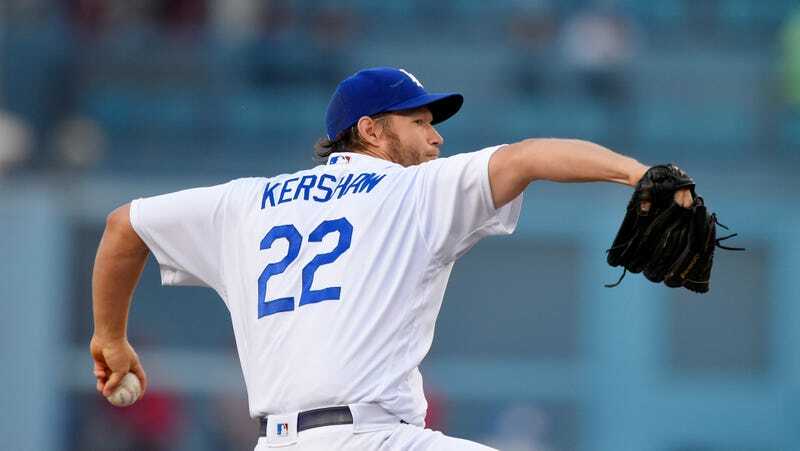 You could spend hours mining and segmenting the nine starts Kershaw has made this year in order to produce various impossible-seeming numbers, but the most ridiculous one of all is in plain sight, staring us right in the face. Through 70 innings, Clayton Kershaw’s strikeout-to-walk ratio is 22:1. 70 innings is by no means a full season, but you really can’t overstate how ridiculous that number is. Going back to 1901, no pitcher with a minimum of 50 innings pitched has even come all that close to Kershaw’s absurd ratio. According to Baseball Reference, Phil Hughes is the gold standard for starting pitchers—he posted a ratio of 11.6:1 in 209 innings in 2014—but Kershaw is currently in elite closer territory, easily beating out Dennis Eckersley’s 18.33:1 mark from 1989. Kershaw isn’t interested in all that nibbling, and that’s what makes this“I strike everyone out and walk nobody” routine more than statistical noise produced by a guy on a hot streak. This is all happening by design, it would seem. Kershaw is currently walking 0.5 batters per nine innings, a mark that’s only been bested by Carlos Silva (0.43 per nine in 2005) among starters who pitched at least 150 innings. Of course, the big difference between Carlos Silva and Clayton Kershaw is that Silva was about as interested in strikeouts as I am in a Redditor’s opinion on the new Ghostbusters movie. This is what’s so incredible about what Kershaw is doing right now: He’s pitching like a guy who is hunting quick outs and efficiency, but coming out of each start with double-digit strikeouts. Some guys can pull that feat off in one incredible start; Kershaw has done it for nine. This is unfair. Greg Maddux was never going to walk anyone, but he also wasn’t going to strike out more than six or seven guys every nine innings. Randy Johnson could come out of a game with 14 punch-outs, but he was at least going to walk a handful of guys and labor through a high pitch count while doing it. These two kinds of pitchers aren’t supposed to exist in the same body, and yet that’s exactly what’s happening in Los Angeles right now. Clayton Kershaw is perfect.